Some kids think it’s O.K. to show off the weapons, drugs, etc. that they bring to school with no consequences. School resource officers (SROs) are not making it any better by putting guns, Tasers etc. on their utility belts, as this can show kids that it’s O.K. to have weapons in a school building. According to Kare 11, a student at Patrick Henry High School brought a .38 caliber handgun to school with the intention of shooting another student after school. Patrick Henry school administrators are now talking about making a stand, and to make the district a weapon, violence, and gang free zone. Another Kare 11 report of a student bringing a gun to school was in Hanover, MN, where deputies took a 9th grade student into custody after reports of seen a gun. According to huffingtonpost.com about 17 percent of American high school students are drinking, smoking or using drugs during the school day. 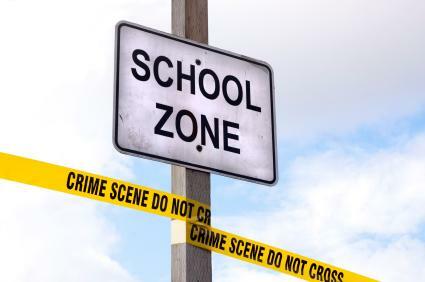 Of 1,003 students ages 12-17, 86 percent indicated they were aware their classmates were abusing substances during the day, and more than half acknowledged there was a place on, or near, school grounds where students periodically go to use drugs, drink, and smoke. On Wlwt.com a middle school student in Lawrenceburg, Indiana, is accused of bringing two knives to school. Students alerted administrators about a threatening comment made by the middle school boy. The school isn’t releasing the child’s grade or age, but he was pulled from class immediately. That’s when administrator said the child admitted to having a pocket knife on him. The administrator said the knife had a 2 to 3-inch blade. According to the administator the student claimed the knife was left in his pants pocket from the night before. According to the site Wdrb.com an Osceola County high school expelled two students. The two students attended Pine River High School in Leroy. The district superintendent says both students were expelled. While they’re not giving out names, they are saying one 17-year-old was expelled for having a knife at school during an athletic event. The other 17-year-old student was expelled for criminal sexual conduct on school property. The superintendent says they made the decision in order to keep a safe and orderly environment for their students. No matter where they go, or what school they go to, students are not completely safe. They may feel that they are, but they don’t know what’s going on in other students’ minds. It is this writer’s opinion that students deserve a place where they can be safe and be educated and not worry about if they are going to live that day or not. When students bring harmful things to school, some of them get arrested and get charged. That goes on their permanent record, so maybe they will think twice before they do it again. But then again, maybe it won’t.